Ben “Tracking down the brothers” – Research into obtaining music rights for a marketing website. “Tracking down the brothers” – Research into obtaining music rights for a marketing website. My main task for the afternoon was investigating feasibility and cost for using the track galvanize by the Chemical Brothers for the multimedia marketing website. With so many small jobs consistently popping up, good organisation and the need for prioritisation really is a must. Things are never as simple as they first appear. Firstly, I had to research which record label the Chemical Brothers are currently signed to. I found the answer to be Virgin Records USA. However, this is not the same Virgin Records as owned by the Virgin Business Empire and Richard Branson. I found out that EMI actually owns Virgin Records. 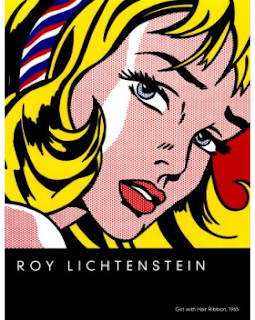 I then rang up the London EMI copyright office and found out whom I needed to speak too. I sent a form with details of the track, its usage and the nature of our business. I am still waiting to hear back on the cost for usage rights. Monday 23rd November was my first day working with Jan-Erik. We started with the plan of action for the day and an overview of the many projects that E-creation is currently operating. At the Enterprise Pavilion in Wallisdown we had a meeting with George, one of the creative designers who works with E-creation. 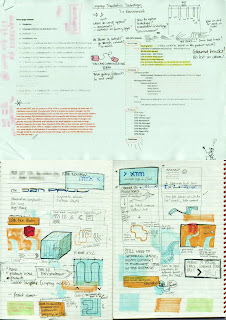 In the creative session, possible creative treatments and ideas for an online marketing project were bounced around. Jan-Erik took the initial brief on Friday, so the project is moving along very quickly. Hello, my name is Benjamin. 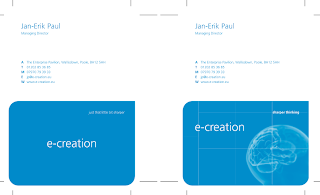 E-creation has taken me on as a Marketing and Operations Assistant. I am 23 years of age and have grown up in the lovely part of the country that is Bournemouth. I graduated last year with a degree in International Relations and Philosophy from the University of Sussex. I also lived in Miami, Florida for a time while taking part in a study abroad scheme at the University of Miami. I have recently returned home from nine months travelling round the world and ‘living the dream’. I was fortunate enough to visit America, Fiji, New Zealand, Australia and Hong Kong, which was an amazing experience. 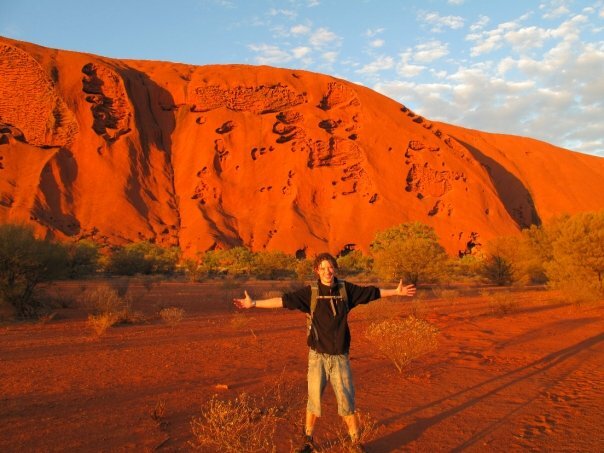 I have had many memorable experiences but those which stand out include learning the ‘HAKA’ war dance with a Maori family in New Zealand and bearing witness to the changing colours of Uluru (Ayer’s rock) as the sun came up one morning. Both were very primordial and life affirming experiences. I do hope that you will come back regularly to check how I am getting on and my journey with E-creation. 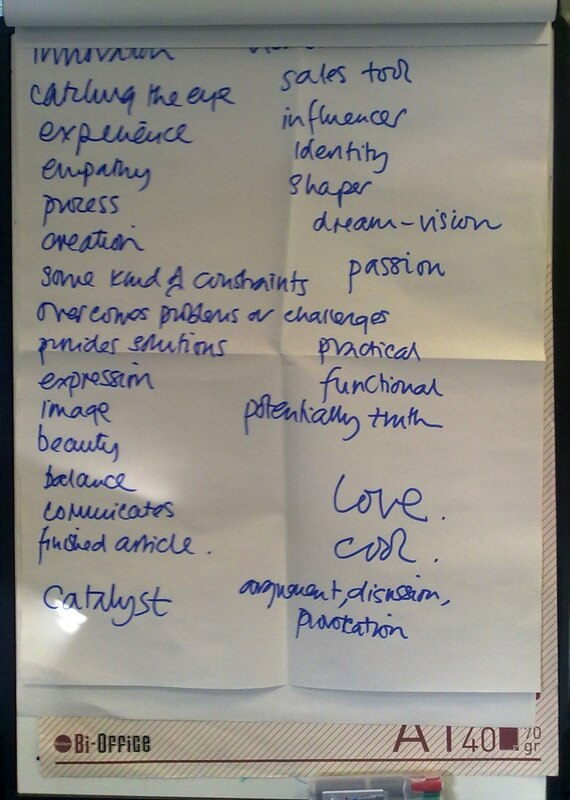 The first step was to ask attendees to describe design. It is interesting to see the different understanding of design, that people have. 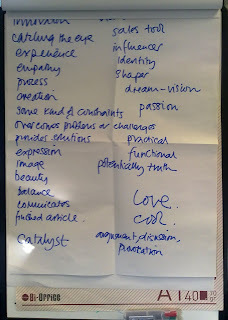 On the left, I have a photo of the terms used by the group to describe design: innovation, creation, empathy, image, beauty, vision, etc. Apple has changed the way that we experience music, making it a 'cooler' experience, adding to the physical act of listening to music, an intangible third dimension - the feel of the music generated by the player itself. For example, one song might 'feel' more cool when being listened to on an iPod when compared to being listened to on a generic brand MP3 player ... but is that possible? Hell yeah - from the point where you pick up the iPod, the way it feels in the hand, the response of those around you, the subtle associations made with the indefinable silhouettes in the Apple adverts - all these elements enhance the music listening experience, making the music better. So how does that relate to E-creation? Well, we also are in the business of creating experiences - from the way that business cards feel in the hand and open their information to the recipients to the website that remembers its visitors and ensures that they are 'caught out' by the intelligence of how they are guided to information. 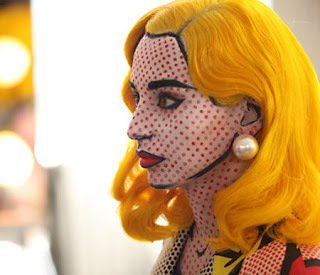 We are always making things cool because lets face it, who doesn't want to be cool?! 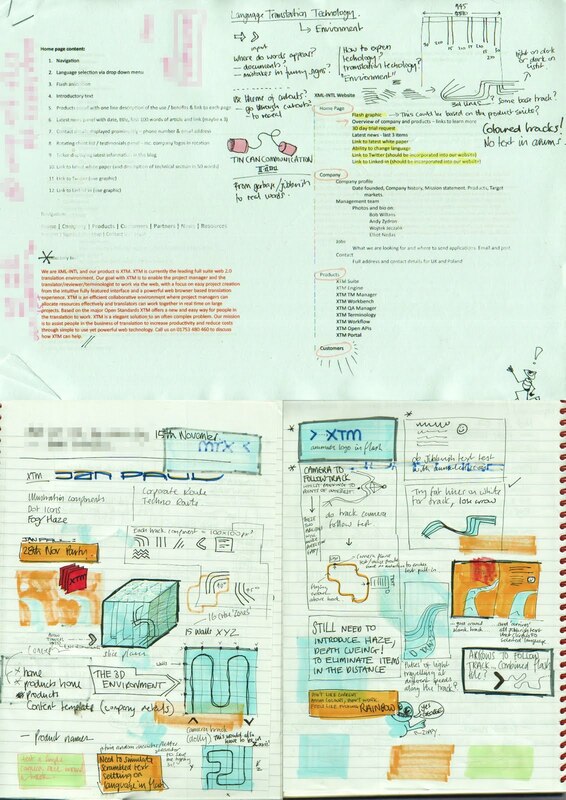 I really need to update this content but here is where we started from with the animation concepts and overall design ideas for the website. "There are two specific target bases. Firstly, companies that require English for communication with their international clients, or when English is the lingua franca of their company and they need to improve their level internally. This is then in-company training for business professionals (currently this includes turbine engineers, pharmaceutical workers and architects). The second client base is those that need to take the IELTS exam (later this will be expanded to the Cambridge ESOL exams as well as TOEFL), as they either need to study or work abroad. A significant percentage of them are doctors, dentists and other professionals whilst the others are students wanting to study in English native speaking countries or in their own country where a large part of the course is conducted in English. It's nothing to do with becoming a teacher. 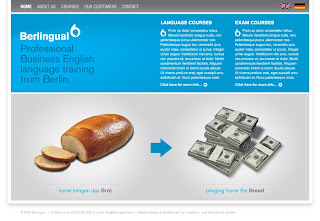 The split is about 50-50 business clients and 'exam' clients." 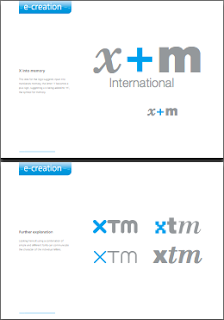 The logo was a pretty straight forward process based on the concept of 'quote marks' to indicate communication, although the final version is very different to the original concepts (and colours) that were developed. The website itself was constructed using HTML and doesn't have any database driven elements, which is quite unusual for E-creation these days, but many organisations do have simpler technical needs, so we are happy to build to their requirements. The opening animation however is intelligent, something that we always try to strive towards rather than simply 'filling space' in a website. As Leon put it in his explanation of the design concept: "The second route is based on 'business words' that are positive and relate to benefits of using Berlingual for language development. These words are supplemented with simple icon interactions that are animated in a loop. This is easy to change or add words as the animation structure just needs to be updated with new content. This route adheres nicely to some of the stronger points outlined in the 'brand perception' analysis." There are a few little clever technical things that might not be obviously though. We have used a Flash application to create many of the graphic headings on the fly. What does that mean? It means that we can change the text in the HTML and the graphics are created automatically so we don't need to keep going back to photoshop. 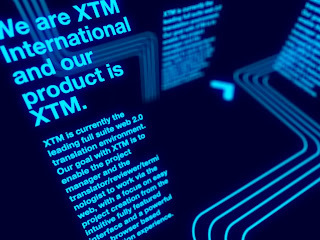 This makes creating multilingual websites much easier whilst being able to maintain graphical integrity - something that will be a key feature in our work for XTM International. 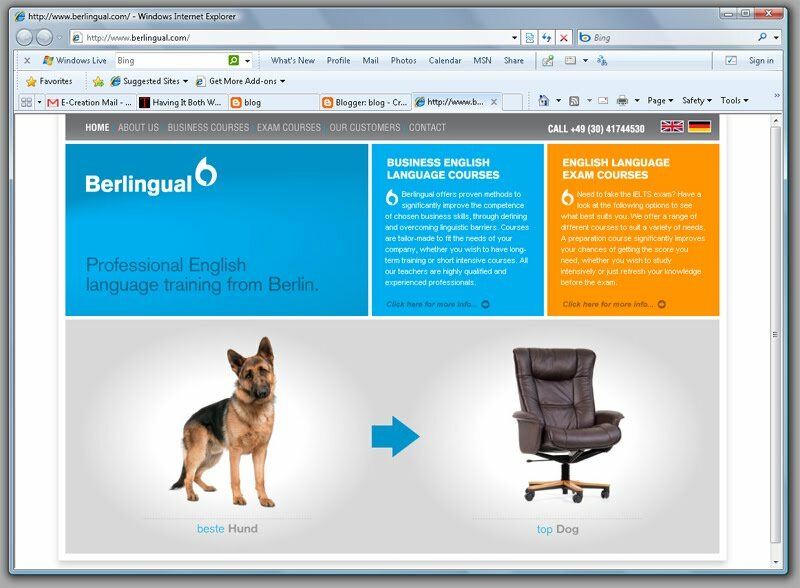 Please do check out the website at www.berlingual.com and feel free to drop us any constructive feedback! Well, we got there in the end, although it was a 5pm teleconference. However, Elliot and Bob seemed very happy with the results so far. 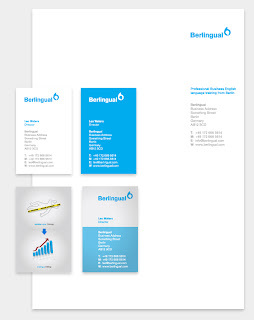 We ended up presenting seven design concepts for the logo with a further six variants of logo direction. We spent around an hour on the phone discussing the various options and have now established three clear directions for the logo. The surprising factor was the client's need for a 'strong corporate' font in the logo. 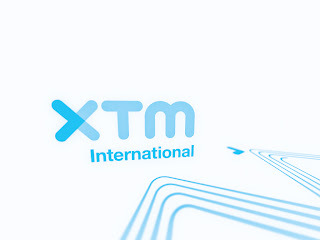 We had spent some time exploring some unique fonts and Leon went as far as to create a unique font for XTM International. I somehow suspect that this unique feature will end up being a feature of the logo in the end. 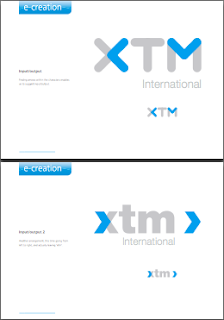 I have attached a PDF that was used to present to the client and gives a bit of insight in the thought processes behind each of the logo options. However, I am currently battling with an rather annoying issue - my Mac Mail has decided to keep a massive e-mail stored in it's trash and everytime I turn on Mail, it kills my system (and also means that I don't get my e-mail) - so am having to collect my e-mail online. Of course, the online e-mail viewing software doesn't give me the same level of control over fonts & colours that are part of the E-creation 'brand' ... so that is going to be a fun one to fix.